A selection of photographs and artefacts by Orcadian artist and musician Louise Bichan documenting a journey through Canada, in the footsteps of her grandmother Margaret Sarah Tait. 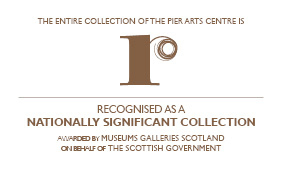 This exhibition marks the International Year of Light and features works of art from the Pier Arts Centre’s unique collection that celebrate light, form and colour. light wave shines a focus on artists who use light to illuminate surface, to cast shadow, to emphasise colour or who have developed other surprising ways to utilise or define light. The permanent collection is open to the public, however the ground floor galleries are closed for an exhibition change over. A display of pupils’ artwork selected by the County’s itinerant art teachers from across Orkney’s Primary and Junior High schools. Stargazing celebrates the work of the latest generation of Orkney artists to have graduated from art schools around the country.